and community standards. 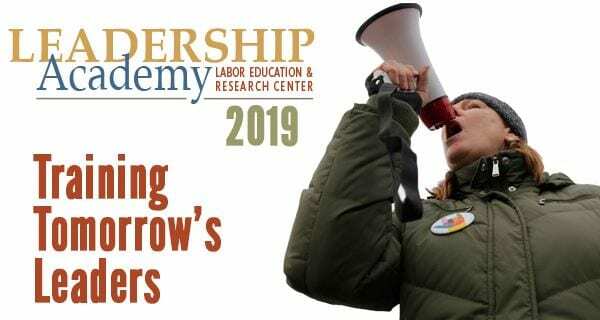 The Leadership Academy is an intensive six-month training program for up-and-coming leaders. Concrete organizing skills, including how to have effective one-on one conversations, identifying and recruiting worksite leaders, and tackling issues that can move co-workers into action. Hands-on campaign planning through a four-month field project, that builds a deeper understanding of coordination, escalation, and overall campaign strategy. New insights and expertise to be a stronger leader, such as identifying different leadership styles, building an inclusive leadership team, and mentoring emerging leaders. Ongoing mentoring and feedback, from LERC faculty and their peers. Cost for the entire six-month program and materials is $1200 per person. Any organization sending more than one person will pay $900 for each additional participant. Applications will be accepted starting in December 2018. Please contact Mark Brenner mbrenner@uoregon.edu, 503-412-3723 for more information.